From the day that Al Perrett was first offered a ride on a 250 BSA, he was hooked. The Board of Directors of the Canadian Motorcycle Hall of Fame is pleased to announce the third member of the Class of 2018. Al Perrett will be honoured at the 13th Annual Induction Banquet and Reunion which takes place November 17th at the Delta Hotels Burnaby Conference Centre in Burnaby. From the day that Al Perrett was offered a ride on a 250 BSA, he was hooked. He was only 14 but thought that motorcycles were awesome. Motorcycles however, would have to wait as his love of skiing got in the way. He competed from the age of 16 until he was 22, even trying out for the Olympics in 1961. In 1966, he borrowed $4000 from the bank, bought five Suzukis and opened a small shop in Richmond. It didn’t take long before he moved to larger quarters selling Yamahas. Money was tight but Al bought out Tyne Side Repairs, a long-time established dealership. This purchase saved his bacon as he had truck loads of parts for sale and was soon able to pay off the bank as well as Deeleys for the Yamahas. He was even able to move to a larger location. In 1972, Al sold his Yamaha shop and moved to Kamloops starting Kamloops Honda. Now he was able to compete more and won his first cross country race. Dan Amor talked Al into going to the Six Days Trials in Italy in 1974 and over the next decade he won several medals. In 1990, Al rode his first Baja 1000 and finished! He was hooked! He has competed in 17 Baja races with different team mates over the years winning class 50 and 60 numerous times. One of Al’s best business decisions was taking on a Harley-Davidson franchise in 1977 and developed a successful business in spite of a devastating fire in 1986. Their HOG chapter raised huge funds for Muscular Dystrophy and the dealership donated many gifts and cash to charities in the community. 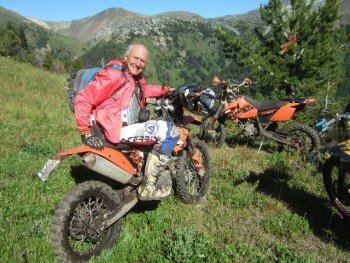 The Chair of the Canadian Motorcycle Hall of Fame Board and all the Directors, are pleased and honoured to include Al Perrett in the Class of 2018. Bar and Hedy Hodgson established Canadian International Motorcycle Heritage Museum Foundation in 1999 and when Dave Lloyd came to them with the idea of a Motorcycle Hall of Fame, they gifted the Foundation to the people. In 2006, the Canadian Motorcycle Hall of Fame was created to preserve and promote Canadian motorcycle history for the benefit of the motorcycling community and public and since then, over 130 distinguished motorcyclists and organizations have been inducted into the Hall of Fame. The Canadian Motorcycle Hall of Fame is a not-for-profit association with charitable status governed by an independent board of volunteer directors from across Canada.